There's no better way to experience the sheer splendor of Guilin’s Karst landscape than by biking. Therefore, some of ETC team make a plan to cycle around with the purpose of finding out the great cycling routes in Guilin for our clients and friends, while relaxing and enjoying ourselves at the same time. 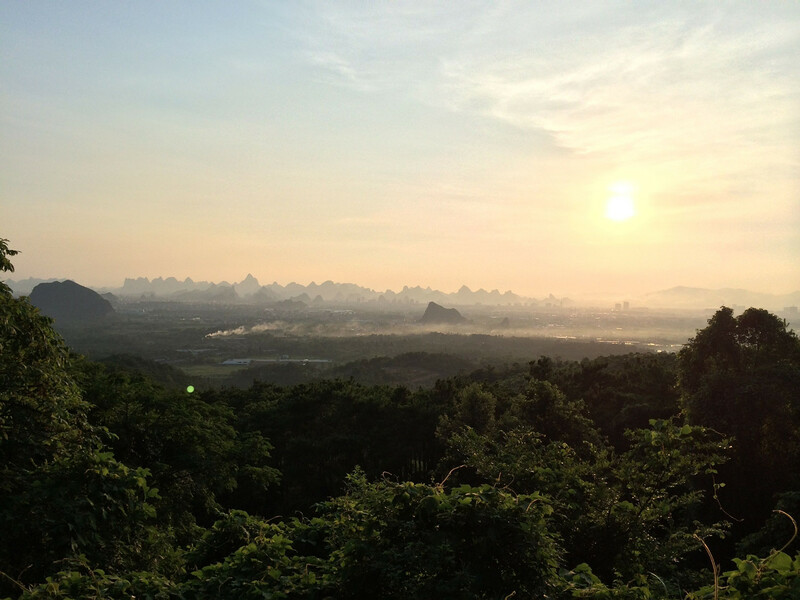 Last Thursday, we had our first biking tour to Yao Mountain, approximately 10 km northeast of downtown Guilin. 909m above sea level, Yao Mountain is the highest mountain in the city, and a should-not-missed destination for all cyclists in Guilin. Before arriving at the foot the Yao Mountain, we have to bike on a bumpy and rugged road with a continuous line of cars, which was surely not a pleasure at all. But it was worth it, - we were awarded with a great view of the endless undulating mountains of Karst geography, which has just been added to the UNESCO World Heritage list recently. Yao Mountain is different from most of the other stone hills in Guilin, and covered with fertile soil and luxuriant vegetation. With the well-constructed road, it is an ideal place for moderate hiking and cycling (there are also cars running up and down). However, the 8.5 km winding road’s several hairpin turns and rather large tilt brought a real challenge for we first-timers. Finally we reached the halfway up the mountain at around 19:00 pm, and enjoyed the beautiful sunset. But it was too late to keep climbing. So we decided to turn back. We hope that next time we can reach the top. Here we would like to share with our biking tips of descending Yao Mountain. So that you can enjoy the thrill downhill under safety. 1. Get low on the bike to get a low centre of gravity, so that you can be better stabilized. 2. Most of the time, use more rear braking. And it’s good to brake earlier into corners, and less during the turn as the bike goes through leaning angles. 3. Always be concentrated to the hairpin turns, road signs and cars in front.